This Boone Trail Highway marker consists of a steel tablet with the portrait of an Indian Chief attached to a 7-feet tall granite arrowhead. The bas-relief portrait was intended to represent “Chief Sequoia” (Sequoyah) of the Cherokee but shows an Indian wearing a feather headdress more indicative of plains Indians than the Cherokee. Although sponsored by the Boone Trial Highway and Memorial Association a Daniel Boone tablet is not present on this marker which was placed to mark old Indian trading paths and buffalo trails. 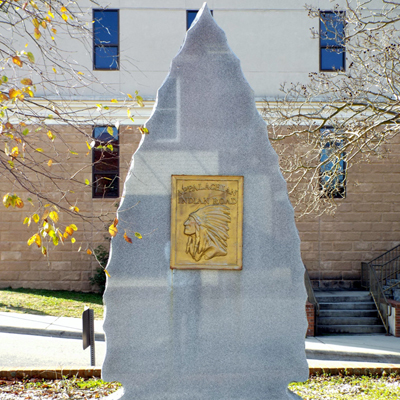 The arrowhead is cut from a single piece of granite and was placed after 2006 behind the Robeson County Courthouse. The original marker, dedicated in 1933, was of stone and masonry construction. It was destroyed in 2006 by a runaway car. The original memorial also had a Buffalo Trail tablet (see subject notes) and a glass enclosed legend showing the route of the trail and listing supporting organizations and individuals. 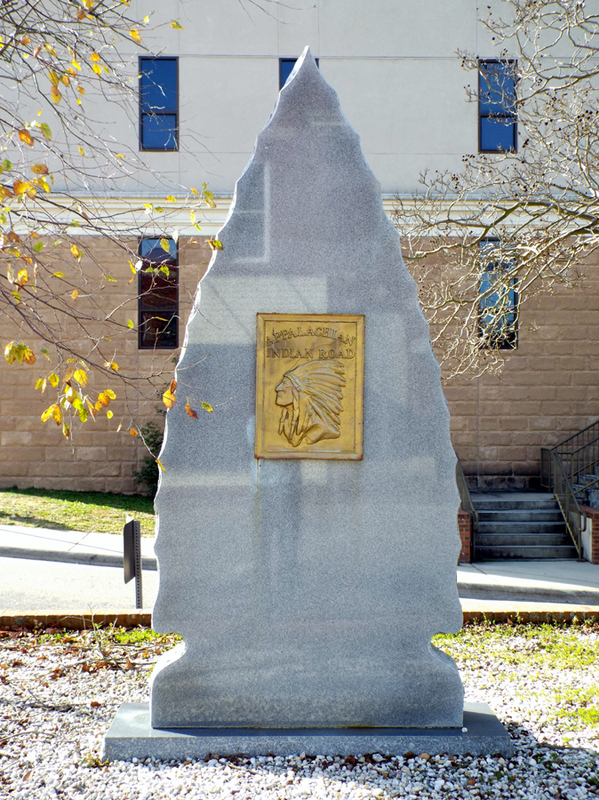 The Chief Sequoia tablet on this monument includes an inscription for the Appalachian Indian Road unlike the one placed about the same time in the nearby Robeson County town of Pembroke. This Boone Highway marker was numbered 59 by Everett G. Marshall. His interest and research of the markers led to the book, Rich Man, Daniel Boone. The numbering system was simply the order in which he found or became aware of a marker. Mr. E.M. Stacy made the principal address at the dedication and quoted from President Roosevelt’s inaugural address, who pledged to be “guided by the sentiment which characterized the spirit of the American pioneer.” Stacy then called attention to the memory of both “whites and Indians of the pioneer days, and to the struggle between them…without analyzing the rights and wrongs…as the result has been American civilization.” After the primary speech J. Hampton Rich presented the monument which was unveiled by three sisters, Rebecca, Dorothy and Catherine Boone, descendants of Daniel Boone. The arrowhead stands behind the Robeson County Courthouse that is located at 500 N. Elm Street, Lumberton. Also behind the courthouse to the right of this marker, at the corner of N. Court Square Street and N. Chestnut Street, is a paved courtyard with the Robeson County War Memorial and plaques to General John Willis, George Washington Tree, Colonel Thomas Robeson, and George G. McPhail, Jr. In front of the Courthouse is the Confederate Monument. A 1939 bronze plaque to Robeson County War Dead is located inside the courthouse. It replaced a wooden painted tablet placed in March 1919. The memorial stands on a raised brick garden bed, under shady trees. The arrowhead was originally located on the grounds of the old Lumberton High School at Walnut Street and Elizabethtown Road.